You know for the past several years I had not worked outside the home. This fall I picked up a job as a floral designer for a local Craft store and well... now its floral design all the time. And Gods help me I am seriously thinking about overhauling my Yuletide decorations. We hung up the outdoor lights on Friday night. Yeah, yeah, working on Black Friday was not enough insanity for me... I talked the Hubs into hanging up the icicle lights on the outside of the house. He swore that he had plugged them in before we hung them up and tested them and wouldn't you know it? We no sooner got them all in place. Flipped the switch and ta-da! one of our strands of lights was halfway blown out. Back up on the ladder he went. Much grumbling and swearing commenced and finally I offered to take him to dinner and we could go to the store and grab another box of lights. So being fashionable, glam, and sophisticated folks- we went to Taco Bell. After dinner, we went back into the store where I worked. (Wanted my employee discount.) Took a lot of "What... you didn't get enough today?" comments from my co-workers and we picked up a new box of icicle lights and some garland for the front porch post. 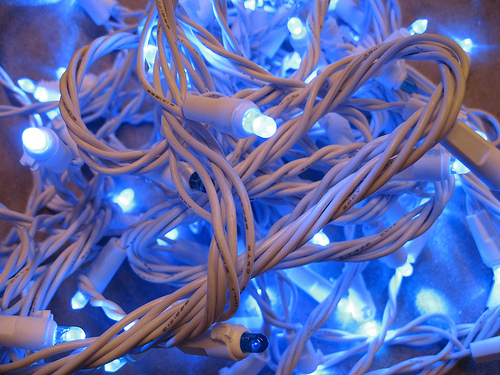 Home again, plugged in the new strand of lights, did some adjustments and now the lights are up on the house! The lit and decorated garland in the kitchen went up on Thanksgiving day... and at the moment I am eyeballing my living room mantle decor. It is usually some of my Santas and simple stems of greenery. But I have been seriously considering doing an elaborately lit garland with flowers and lots of ornaments... in a red and gold Solstice theme. And probably my insanity for floral design and decorating should be treated. Maybe Martha Stewart or David Tutera has a program. 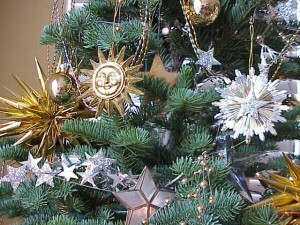 For years I have been collecting sun, moon and star ornaments. I have dozens of golden suns that go on our tree every year. For a while the Yule tree was gold and blue. Now it's gold, red, soft green and white. I am not looking to change the tree, but the mantle... well all bets are off this year. Ah, a challenge! And how well he knows me. I'm already hatching ideas. About a year ago, he moved into a spacious 2 bedroom 2 bath apartment with his older brother... and it never occurred to me that all of my oldest sons decorations are his, and not theirs. Sure when they moved in and I took one look at their mantle and promised to put something together for their fireplace for the holidays. I decorated that mantle as a holiday housewarming gift. Its a very manly outdoor winter looking. It is rustic twiggy/pine cone/ evergreen and it goes with their hunting and fishing theme tree. So I imagine today Kyle and I will get that red and white mini-tree started. 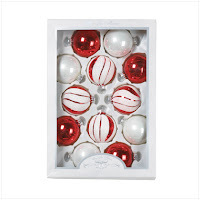 I'm thinking white tree/ red lights with white cords, cardinal birds and white and frosted red glass ornaments... and you see? It is a sickness. Stop me before I stop myself... LOL! While we are out there shopping and looking for items for his tree, I will also be on the lookout for something celestial or magickal that will inspire my own mantle redo this holiday season. I'll keep you posted and let you know what I find. Ah yes, I am spending my day off doing more floral design... it is nice to let this other side of my creative self out to play.